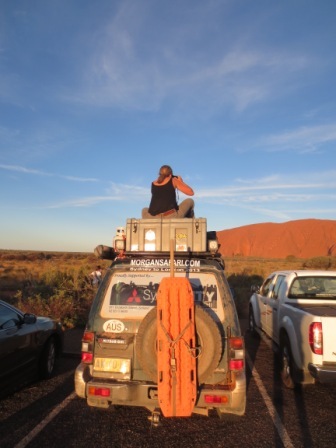 Back on the tarmac we headed to Uluru – another long day at the wheel but realising that the next day was Anzac day, we were keen to attend the dawn service there. We’d never been to an Anzac dawn service and felt it was something we should do before we left Australia. We arrived late into the Uluru camp resort – have driven in the dark from Curtin Springs – this time dodging the wild camels rather than Kamikaze roos – they reckon there’s around 30,000 wild camels living in the centre of Australia! The Uluru resort is just one huge complex catering for the masses whether you’re looking for exclusive suites or just a camping spot it’s smartly done and the facilities are great – considering it’s remote location we found the prices were pretty reasonable too. Alarm call at 5am the next day for the Dawn Service – which could have done with being slightly later – as it was still dark when it finished! However, it was good to go and the service was very moving. In true Aussie style, the solemn remembrance service is swiftly followed by a day of celebration and Bundy was being served with coffees by 7am!! The 2UP tournaments started straightway, making the most of the only day you can play it in a pub (apart from Broken Hill, where they have a special license to allow you to play it all year round!) Got to love the Aussie spirit for finding any opportunity to booze & gamble! The rest of the afternoon we went to the Olgas, another spectacular rock formation west of Uluru, before heading back to the big rock for sunset. 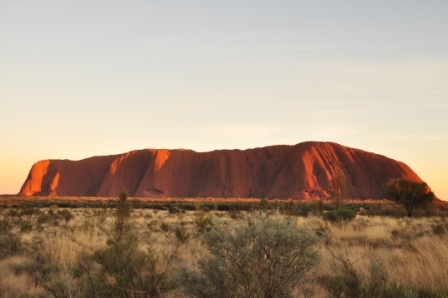 Watching the sunset at Uluru is on most people’s bucket list, which means that you also have to share this special moment with hundreds of others! We went early to get a good spot, and once parked up, we climbed up onto the roof to watch the spectacular sunset show. 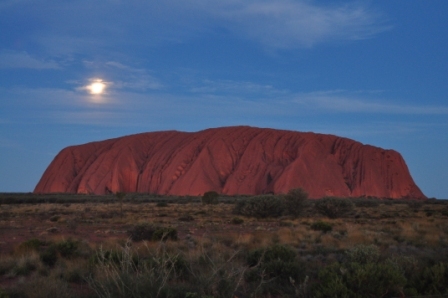 Despite the hoards, it was amazing to see and we stayed later than most watching as the moon rose above Uluru. In fact it was so stunning, that we got up again at 5am the next day to go and watch the sunrise followed by a walk to the rock itself. 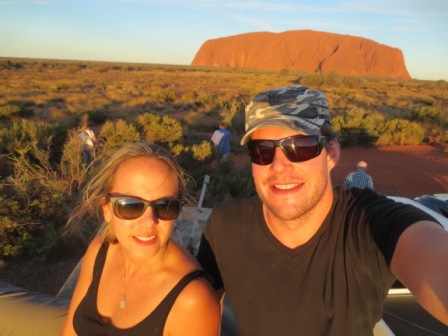 I think we both underestimated what Uluru would be like and we both quite taken aback with just how stunning it all was, combined with the Aboriginal significance we both felt quite moved by our time there and would easily have spent longer there to simply sit back and take it all in. Driving on towards Alice Springs, we took the loop road through Kings Canyon and into the East MacDonnell Ranges – stunning drive through the valley spotting lots of wild horses, roos and dingos, although the unsealed road was corrugated and slow going so we didn’t make it to our intended stop at Finke Gorge. Instead we took the upper road and camped the night at RedBank Gorge. Arriving after dark, isn’t ideal as you really have no idea where you are or what’s around you and as we set up the tent, we could hear the dingos howling and wasn’t long before we had a visitor. Having both recently seen an episode of ‘I shouldn’t have survived’ where a guy got mauled by a pack of dingos, we were thankful that this dingo hadn’t bought any of his buddies along! However, as soon as we’d gone to bed, the little bugger kept us awake with his running back and forth and at one point jumping up onto the bonnet of the car and standing on his hind legs looking at us through the tent window! I can’t believe that in a few months this could be lions and elephants running around our camp – not just 1 little dingo!! ← Oodnadatta Track & Lake Eyre – 3 TIMES!! I actually saw your vehicle parked in the supermarket at Yulara. I am excited to read about your adventures. enjoy your trip!